Quick and Easy Poinsettia | Low-Carb, So Simple! Do you have an occasion to toast to, but don’t want to settle for plain old champagne? Having friends over for drinks and need an easy-to-make, simple, yet flavorful cocktail? Here’s a great recipe for a slimmed down Poinsettia. Stir the chilled orange-infused vodka and stevia together in a champagne flute. Add in the Brut sparkling wine and top it off with the cranberry juice. The ingredients for Poinsettia are easy to come by. 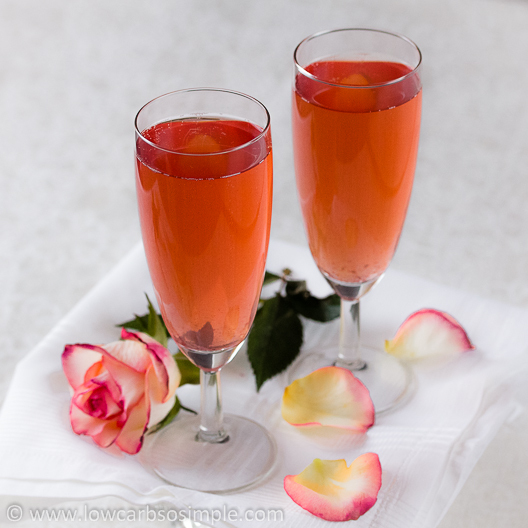 All you need is some orange-infused vodka, cranberry juice, some Brut (dry) sparkling wine and liquid stevia. You could make the vodka yourself by following the instructions on The Shiksa, or buy some ready-made Orangecello. Just be sure that there is no sugar added. You can also use my recipe for “Low-Carb Limoncello” and just replace the lemon peel with orange peel. To make sure your cranberry juice is 100 % juice and organic, you could also make it yourself. The amount you need is just approximately a teaspoon or even less. As for the wine, selecting a Brut sparkling wine is essential. Marks & Spencer describes Brut sparkling wines as having “a delightfully refreshing, lively dry fizz, aromatic and tangy, with mouthwatering flavours of green apple and pears.” These flavors complement the taste of oranges and cranberry perfectly, but the best part is that Brut sparkling wines are known for being low-carb. Bella Online explains that since Brut wines aren’t too sweet, they have much less carbs and calories than white wines and other sparkling wines like Prosecco. The usage of liquid stevia makes this drink really low in carbs. Liquid stevia should be plant-based, not synthetic, and in ideal case organic. Since the sweetener practically carb-free and calorie-free, it’s a safe option for diabetics as well. Chef Emeril Lagasse adds crushed ice to his Poinsettias, but it’s better to just chill your ingredients before assembly so you don’t end up watering down the cocktail. I hope to publish my book on 26th March in Kindle format. And now, finally the big surprise: as my thanks to you for reading my blog, you are able to get the book for FREE for two days after I publish it. Yes, you read it right. The book will be available for FREE for two days. And remember, you don’t have to have a Kindle reader to be able to read the book, you can download a Kindle reading application for free to your computer, smartphone or tablet. Like I mentioned in my previous blog post, all the recipes in my book will be all natural, sugar-free, gluten-free, vegan, have less than 1 gram net carbs per serving and 5 ingredients or less. Stay tuned for more updates about my book!